Overview - Welcome to the future. Biological war has decimated life on Earth. Los Angeles is a windswept ghost town where Robert Neville tools his convertible through sunlit streets foraging for supplies. And makes damn sure he gets undercover before sundown, when other "inhabitants" emerge. The Omega Man adapts Richard Matheson's novel I Am Legend into a high-impact, high-tension saga of a fate not far removed from reality. Charlton Heston is Neville, fending off attacks by The Family, sinister neopeople spawned by the plague. He also becomes a man with a mission after meeting Lisa (Rosalind Cash), another unifected survivor - and guardian of some healthy children representing our species' hope. In this barely recognizable version of Matheson's story, Charlton Heston stars as Dr. Robert Neville, a man hired by the government to develop an experimental bio-weapon. As is usually the case in films like this, the experiment went terribly wrong, and has left the entire planet radiated. Neville now believes himself to be the last man on Earth, forced to hole up in a compound designed to keep the legions of scarred (and very pissed off) mutants at bay. Luckily for Chuck, his doomed existence will improve when he stumbles upon a small cadre of surviving humans, aka "The Family." With his hope finally reawakened, Neville sets about finding a cure for the disease he helped to create, while The Family must figure out a way to re-start society and rebuild the human race. Of course, the mutants have other ideas, and re-igniting the age-old conflict of religious fundamentalism versus rational science, Neville will be hunted down like Frankenstein's monster and put on trial for his crimes. Where humanity will eventually go is at the heart of the fundamental questions the climax of 'The Omega Man' seeks to answer. As I hinted in my introduction to this review, I think it's really cool that a film like 'The Omega Man' can been rescued from the graveyard of late-night cable and shined up like a brand new penny for a new special edition release such as this. 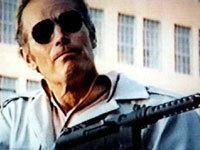 But if rediscovering a film also means we must re-evaluate it, then I have to be honest and say that time has not been particularly kind to the truly hokey nature of 'The Omega Man.' I remember seeing this film as a child and being scared witless. Watching 'The Omega Man' again now, the only thing I was afraid of was that if I laughed any harder my head might explode. I only vaguely recall reading Matheson's original story, but I do remember that 'The Omega Man' borrows only the basic concept, jettisoning many of his more intriguing thematic ruminations, and replacing his vampires with an utterly ludicrous, unintentionally hilarious legion of Luddite mutants. The costume design in particular is truly something to behold, with many of the gigantic afro-sporting monsters looking like extras from 'Shaft' meets the cast of 'Shaun of the Dead.' ("Honky paradise, brother?" one character asks at one point, without irony.) Viewed thirty five years later, this frozen-in-1971 aesthetic is even more jarring as the mishmash of philosophical dialogue lifted right from Matheson's work that doesn't fit at all with the film's grooveified milieu. Simply put, it's hard to take characters pontificating about the end of the world very seriously when they're being chased by a mutant who looks an awful lot like Foxy Brown. But while the first two-thirds of 'Omega Man' are ridiculous enough on their own, the film completely disintegrates in its final stretch, as it suddenly grafts an inexplicable Christ allegory onto the story, with Heston captured by the mutants and subjected to some sort of atomic version of the Salem witch trials. While a similar plot device worked much better in the 1968 classic 'Planet of the Apes' (which 'The Omega Man' desperately strives to replicate), here it's handled so ineptly and in such a rushed fashion that any weighty themes that the film might have hoped to address are lost in the resulting muck of narrative dead-ends. Not helping matters through all of this is Heston himself. 'The Omega Man' was the third in Heston's so-called "doomsday" trilogy (following 'Apes' and 1970's 'Soylent Green'), and he seems utterly bored. He was severely miscast as Neville, a role originally envisioned as an everyman, because Heston only knows one note to play -- that of He-Man with a machine gun. He doesn't convey any sense of vulnerability (or likability, for that matter). Instead, he spends just about the entire movie with the same slack-jawed, "Oh my god, I've just seen a damn dirty ape!" look plastered on his face. Having said all that, I'd be lying if I didn't admit to enjoying aspects of 'The Omega Man.' There will always be a modicum of entertainment value to be had in watching Heston begin chased by blaxploitation mutants, and the few thematic threads left over from Matheson's original story still possess some intrigue. 'The Omega Man' also boasts some decent production values for the time, with many of the sets and costumes still impressive. None of this is enough to elevate the film anywhere above the level of guilty pleasure, but if you want nothing more than to watch Charlton Heston blow away bio-radiated mutants with robes and torches, 'The Omega Man' should fit the bill. 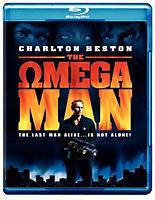 'The Omega Man' first received the remaster treatment back in 2003, when Warner issued the film on standard DVD. Since the studio is only releasing the flick on high-def as a quick cash-in with the upcoming Will Smith update, it's no surprise that this Blu-ray's 1080p/VC-1 encode (identical to the HD DVD) is minted from the same master used for that previous DVD. But in this case that's actually a positive, as the 2003 remaster was a real surprise, with 'The Omega Man' looking way better than any 1971 film has a right to. I would even go so far as to say this is one of the better catalog remasters I've seen from Warner in recent months. Warner has really spiffed up the print, with very few signs of the kind of wear and tear that you'd normally associate with such a dated sci-fi flick. Sure, there's grain throughout and some dirt specks and such, but it is consistently minimal, to the point where you forget about it within minutes. Colors are nicely reproduced as well, with reds and blues especially vibrant and clean. I can't say that the level of detail rivals that of a new release, but considering the age of the film and the archaic effects techniques of the time, the illusion of depth is considerable, and shadow delineation is well above average for a catalog title. The studio has done a fine job with the encoding, too, as there are no major compression artifacts to speak of, nor is edge enhancement an issue. An impressive transfer, all around. Unlike the video, the audio on this Blu-ray edition of 'The Omega Man' is unexceptional. Presented in Dolby Digital 1.0 Mono (192kbps), this is one dated soundtrack. Everything sounds compressed and tinny, with a brittle high end that can hurt the ears at high volumes. Low bass extension is also as flat as a pancake, with all of Charlton Heston's gunfire sounding like it came from one of those plastic pistols you buy in a five and dime store. Since this is a mono track, there is no sense of envelopment or even decent stereo separation to the mix -- it's just one big pile of vintage audio mush emanating from the center channel. I guess I can compliment the track for at least being free from obvious defects (dropouts, etc. ), but that's not really saying much, is it? Considering that 'The Omega Man' has only a marginal cult following, I suppose it's no huge surprise that the film has yet to receive a truly robust supplements package. This Blu-ray edition ports over all of the extras originally included on the 2003 standard-def DVD, but this is such a threadbare collection that even the film's most die-hard fans aren't likely to take it in more than once or twice. Introduction (SD, 4 minutes) - Oddly, Warner assembled original cast members Eric Laneuville ("Ernie") and Paul Koslo ("Dutch") and screenwriter Joyce Corrington to provide a new introduction to the 2003 DVD, but all we get for their trouble is four minutes of material (half of which is taken up by film clips). Surely the trio must have had enough amusing little recollections that a full featurette could have been in order, but no such luck. Theatrical Trailer (SD) - The film's original trailer, and although the art of movie promotion come a long way in the past 35-odd years, this one sells the film pretty well. 'The Omega Man' may not be a particularly good movie, but its woefully dated production values and hilarious nods to blaxploitation arguably make it a true camp classic. As a Blu-ray release, this one's a mixed bag. Although it boasts a surprisingly robust video transfer, the tinny audio and wafer-thin extras are decidedly retro. If you happen to be a fan of the film, I wouldn't dissuade you from picking this one up -- just be sure to set your expectations accordingly. Portions of this review also appear in our coverage of Dunkirk on Blu-ray. This post features unique Vital Disc Stats, Video, and Final Thoughts sections.